This soup is divine. I whipped it up in less than an hour, and the whole family devoured it. Cece kept saying, “mmmm….this is good, mama!” That kind of response to a healthy meal makes my day. It is a complete meal, as it is packed with protein from lentils, veggies and satisfying fat from coconut milk. The ginger and curry powder are very warming, which makes this meal ideal for a chilly fall day. And not to mention they are anti-inflammatory, promoting overall wellness. The squash is full of Vitamin A, which is anti-viral and immune-supportive. What more could you ask for in a Fall soup? 1. 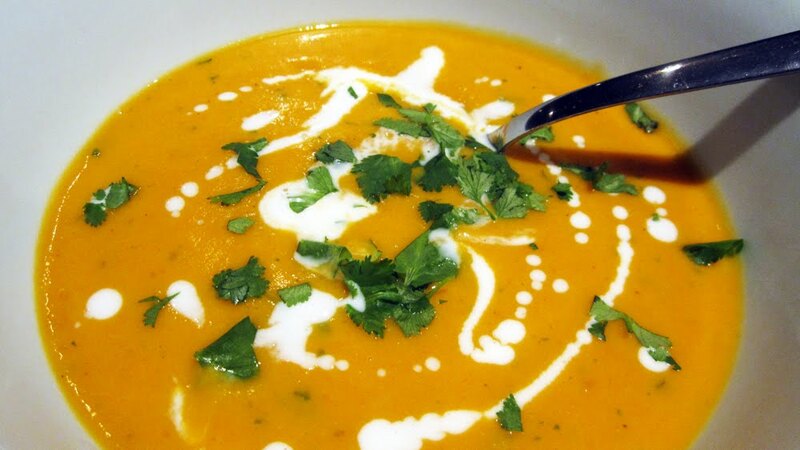 Cook the squash and lentils in 5 cups of water in a large soup pot until they are tender, about 30 minutes. 2. Heat oil in skillet over med. heat and saute onion and garlic. About 5 minutes. 3. Add onion and garlic to soup pot. Stir in salt, curry powder, coriander, ginger, and lemon. Also add tomatoes. 5. Add can of coconut milk and maple syrup to soup pot and mix thoroughly. Add more salt if needed. 6. Top with plain yogurt and cilantro.